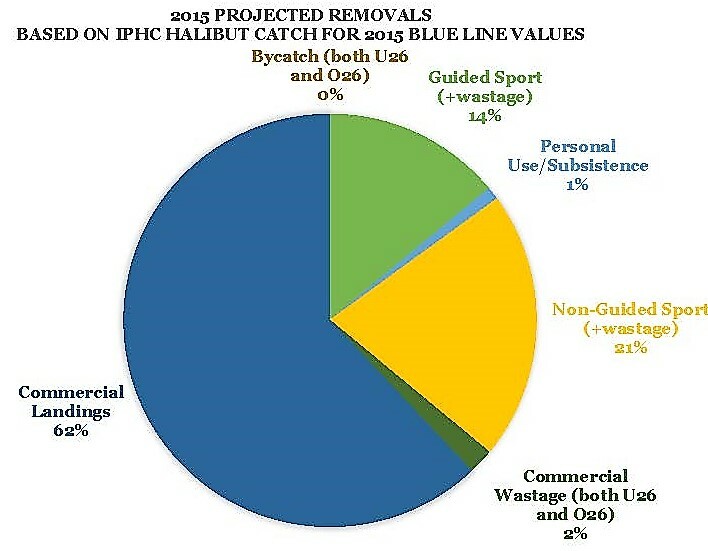 The International Pacific Halibut Commission (IPHC), the North Pacific Fishery Management Council (Council), and Alaska Department of Fish & Game (ADFG) work together to manage halibut catch in Alaska waters. The IPHC, as its name indicates, is made up of United States and Canadian representatives, following an international treaty the countries signed in 1923. The Council is the United States Federal fishery management group. The Council works with information collected and analyzed by ADFG, as well as stakeholder input, to make recommendations to the IPHC on management for Alaska halibut fisheries. 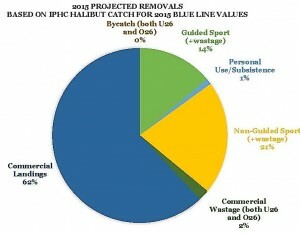 Each year, the IPHC uses surveys to estimate the number and age of halibut and the number of spawning females. Scientists then calculate how many pounds of these fish can be caught without hurting the overall population. Below is an example of what this might look like; it is not an example from any given year. 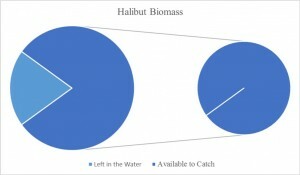 A percentage of the pounds of halibut available to catch are set aside at this point for subsistence fishing, bycatch mortality, and unguided recreational sportfishing. Below is an example of what this might look like; it is not representative of any particular fishing year. The remaining pounds are the halibut allocated under the Catch Sharing Plan: commercial halibut fishing and the charter/guided fishing sector. In Southeast Alaska, regulatory area 2C, the guided sector typically receives 18.3% of this number. * That percentage only changes if the pounds available to catch go above or below certain numbers. The chart below shows 18.3% in blue. Management rules, like no fish over 43 inches or under 80 inches, are based on how many pounds are available within the 18.3%. Even though the percentage remains constant, the number of pounds changes based on the calculation scientists use at each step described above. ADFG and stakeholders, like SEAGO Board members, analyze the pounds available, how many fish that would represent for guided anglers, and different management measures. They then make suggestions to the Council. The Council considers these suggestions and passes its recommendations up to the IPHC for approval. *Area 2C is the IPHC region for Southeast Alaska, south of Yakutat. Yakutat is managed as part of the 3A region with some different management measures. The program discussed below would apply to both regions, 2C and 3A, though examples have been limited to 2C for brevity. In recent years, declining Pacific halibut stocks have prompted regulators to increase restrictions for Alaska’s guided anglers. Charter operators, who make a living by providing exciting fishing opportunities, are struggling to maintain their businesses when these opportunities are cut down. The Catch Accountability Through Compensated Halibut (CATCH) project researched a creative solution to increase the guided sport (charter) sector’s allocation using the commercial halibut Individual Fishing Quota (IFQ) program. Under the CATCH plan, an organization representing guided anglers would purchase IFQ shares from willing IFQ sellers. These IFQ shares for Southeast (2C) would essentially be added to the 18.3% charter allocation described in the above Background Information. The result would be a benefit to all guided anglers because a larger percentage can lead to less restrictive management measures. Without this innovative idea, guided sportfishing would only receive less restrictive halibut rules if we asked the Council for an increase in that 18.3% catch allocation. This sounds easy, but it would be a serious uphill battle, facing the strong opposition of the commercial halibut industry. The CATCH plan offers a market-based solution, meaning that we are not asking for more for free, but broadening the market for willing IFQ sellers while respecting the conservation goals of the IFQ Program. By increasing fishing opportunities for anglers, the CATCH plan would result in a more economically viable and stable charter sector, which would greatly benefit Alaska’s coastal communities. Before reading this section, be sure to take a few moments to glance at the Background Information and short CATCH Program statement. This program has a short term goals, like letter writing, and a long term effect on our industry by maintaining and improving our management measures. Below is a more detailed explanation of how the program would work. Step 1: A Recreational Quota Entity (RQE) would be allowed to purchase, hold, and manage commercial halibut quota on behalf of the guided recreational sector. The Council and the National Marine Fisheries Service would approve this entity as a qualified to purchase IFQ shares in the Alaska Halibut and Sablefish IFQ Program. The Council is currently considering controls to protect the objectives of the IFQ program and avoid significant economic effects to the cost and availability of IFQs. Some of these controls include annual limits on IFQ purchases, total limits on IFQ purchases, and restrictions on purchasing certain types of IFQs. Step 3: This purchased IFQs would be held in a common “pool” for the benefit of all guided recreational anglers in that region. The pool of quota would be added to the 18.3% allocation discussed in the Background Information. * It can also be used as a buffer if the halibut harvest is uncertain. 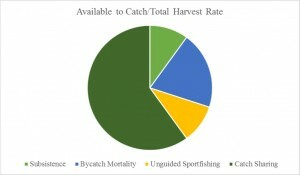 The Council and IPHC would use this “revised” allocation when recommending the next season’s harvest management measures. With time, the RQE would purchase enough IFQs to maintain consistent management measures in times of low halibut abundance and make meaningful impacts on the allocation and management in the long run. For resale and other economic purposes, IFQs should be fully transferable (two-way) across sectors, and retain its original commercial designation. 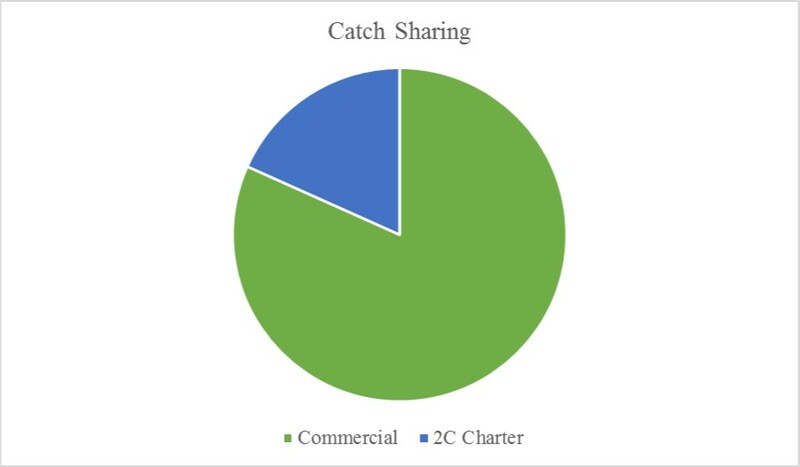 Throughout this time, the charter sector and its representatives will work with state and federal agencies to improve how the guided fishing industry reports their catch and remains accountable, as the Council requires for all catch share programs. *As mentioned above, Area 2C is the IPHC region for Southeast Alaska, south of Yakutat. Yakutat, though part of Southeast, is managed within the 3A region and has some different management measures. Examples have been limited to 2C for brevity. In October 2014, the North Pacific Fishery Management Council authorized the Recreational Quota Entity Committee to contribute to the development of the Recreational Quota Entity program by the Council. SEAGO Board Vice-President Russell Thomas sits on the RQE Committee and assists in developing the Committee’s preferred plan alternatives. The Council considered the RQE program’s initial review analysis at the April 2016 meeting in Anchorage, AK. After considering the RQE Committee’s preferred plan alternatives and hearing public testimony, the RQE program was passed forward for Final Public Review at the December 2016 meeting. Documents from these meetings can be found in the right-hand column of this page or by visiting http://www.npfmc.org/recreational-quota-entity-committee/. This cap will be managed on a sliding scale between RQE and GAF, with GAF transfers restricted to accommodate RQE holdings. D class is restricted in 3A. In 2C, the RQE may purchase 10% of D class shares and 10% of B class shares. The RQE may purchase any percent of C class shares. Small blocks of quota ≤1,500 (in 2015 lbs) are restricted in both sectors. 50% equally to all catcher vessel QS holders in the applicable area who hold the amount of QS that yielded 2,000 pounds of IFQ in 2015, and redistributed among qualified QS holders proportionally to their holdings. 50% equally among all CQEs that held halibut QS in the applicable area in the preceding year, unallocated RQE IFQ would be left in the water. Changed from a requirement for the RQE to reflect the Council’s directions for use, aside from purchasing halibut IFQ, such as halibut conservation or research, promotion of halibut, and administrative costs. For final approval to purchase halibut QS, the RQE must submit articles of incorporation and management organization, including bylaws and a list of key personnel, such as board members, officers, representatives, and managers. The RQE must file an annual report, including lists of purchase or sale of QS or CHPs, use of funds, and changes to bylaws or personnel. For updates on the status of the RQE, sign up for SEAGO’s newsletter.